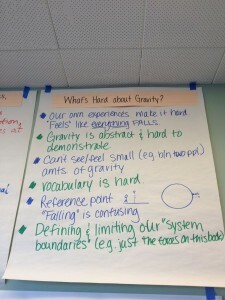 What is So Hard About Gravity? Make a list with fellow science teachers about what might be difficult about a particular science topic. Time to work together with colleagues can be rare, but a conversation you might consider having with your colleagues is: what is it that makes science, or better yet, specific science topics, "hard". The NSRC's Investing in Innovation (i3) initiative supports and promotes high quality, inquiry-based science education programs and helps establish infrastructures to sustain those programs for decades to come. This initiative studies the effects of the NSRC's LASER Model in grades 1-8 in three regions: North Carolina, Northern New Mexico, and Houston Independent School District. Washington, DC-based interns will be based at NSRC's DC offices and may be asked to travel to one or more regional sites to assist with summer workshops.